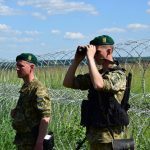 Local inhabitants informed the border guards of Mostyska Detachment about appearance of some unknown persons nearby the state border. Verifying information the border detail started to the place immediately. Soon, the officers detained three violator 50 m before the border – the citizens of Ukraine, China and Kyrgyzstan, who bypassing the check point planned to cross the Ukrainian-Polish border. The offenders will be called to administrative responsibility under article 204-1 of the AICU, they were delivered to the border unit. Currently, the law enforcers establish all circumstances of the offence. This entry was posted in Translated Media-News from Ukraine and tagged China, Kyrgyzstan, Ukraine, Ukrainian-Polish border on September 5, 2018 by oksana.